Here they are. 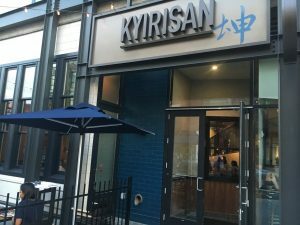 The twenty restaurants that, right now, are my favorites in the DC area. They have the energy, the service, the atmosphere, and, above all, the food. They are not necessarily what some would consider the “finest” restaurants in DC — a term that implicitly gives a leg up to highbrow establishments with fancy trappings and expensive ingredients. Instead, these are the restaurants that I think best accomplish what they set out to do and that I recommend to friends who ask me what’s worth checking out. You’ll notice a lot of newish restaurants on the list. Some of that is my own personal bias in favor of the new and novel when it comes to food. But it also reflects the fact that we’ve had an incredible influx of ambitious restaurants in the past couple of years that are now in their prime. This’d be a runaway if it weren’t for the seating policy craziness. Because once you sit down and start tucking into Aaron Silverman’s delicious, idiosyncratic food, you know you’d walk across broken glass to come back. The lychee salad with pork, cilantro, coconut cream, and red onion remains a revelation no matter how many times I’ve had it. But it’ll be just one of many bites that will bring your conversation up short. It could happen with just about any of the pastas on the menu, like the recent spaghetti with pistou, garlic scapes, jalapeno and blue crab. (The one pasta I didn’t love was the spaghetti with strawberry-tomato sauce, which seems to be a love-hate kind of thing.) The smoked brisket has been among the family-style entrees since the beginning and is reliably terrific. And when I went in as a single diner, my helpful waiter let me in on an off-menu secret — you can order the $31 brisket as a $12 sandwich with the same horseradish, slaw and toasted brioche. It’s one of the best sandwiches in town and gives you a sense of how Rose’s staff aims to please. One of those rare restaurants where you can point to anything on the menu and know that it’ll be delicious and surprising. Chef-owner Cedric Maupillier has put a lot of thought into his medium-plates menu and seems to revel in under-promising and over-delivering. Take what’s listed on his menu simply as “Leeks Dijonnaise,” which sounds relatively simple, if not boring, but shows up as a steamed and sliced leek salad with mini croutons, fried capers and chopped egg. The tartiflette fritter (a take on a traditional dish from the French Alps with potatoes, reblochon cheese, lardons and onions) may be one of the best bar snacks ever. And then there’s the fried chicken “coq au vin,” which some consider overhyped, but which I’m a fan of for it’s crisp thigh meat served almost Korean-chicken style with a coq au vin glaze. Desserts here are worth the calories, including a good sticky toffee pudding with maple ice cream. Much has been made of Chef Jeremiah Langhorne’s commitment to creating a “Cuisine of the Mid-Atlantic.” If this is it, sign me up. Sure it’s keenly (some would say obsessively) local and seasonal, but it’s the flavor combinations that inspire – smoky, charred, pickled, herbal, crunchy and creamy. If you’re not from the south and never sweetened your food with sorghum, this is the place to experience it, both at the beginning of the meal in the butter accompanying the excellent bread and at the end with a gratis sorghum cookie. And while I’m not too hung up on atmosphere, there’s something elemental and thrilling about the huge blazing hearth being tended by the well-trained kitchen staff. 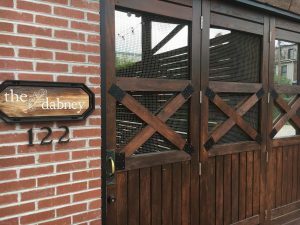 Eric Ziebold manages to walk the fine line between fine dining and a slightly more casual vibe (I haven’t yet been to the fancier Metier side of the house). Sometimes Kinship veers off into mild pretentiousness, such as the division of the menu into vague categories like “Craft,” “History,” and “Ingredients.” But Ziebold’s cooking redeems all, with careful technique and plating that let you know you’re in good hands. The menu changes often but the whole chicken and lobster French toast are stalwarts that are likely to be around for good, as are Ziebold’s Parker House rolls that he brought with him from CityZen. One of the other popular dishes, the torchon of white mushroom, was less interesting and made me long for the traditional foie gras. The desserts get as much attention as the savory courses, as does the coffee, which comes with a round of toffee that you break into pieces with a little metal hammer. 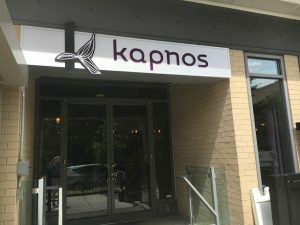 Some of the best food in DC is coming out of this Gallic seafood kitchen in Merrifield that started out as a pop-up and has turned into a permanent gig. Every time I’ve dined there, Chef Jen Carroll has been womanning the pass, ensuring that every plate leaving her kitchen is up to snuff. Start with several smaller plates like one of the rillettes (the chicken liver is delicious), one of the salads, and maybe the terrific frito misto. The smashed fingerling potatoes with whipped raclette and crispy salami is a deserving hit but the matchstick fries are equally addictive. Then, depending on how many people you have, order something from the “for the table” section. The succulent roast chicken is perhaps the best in town — better than Kinship for my money — and other choices like the bone-in pork chop or the bouillabaisse chock-full of perfectly cooked seafood are equally worthy. There aren’t many places that are as much an expression of one person’s vision as Kyirisan. This is Tim Ma’s cooking and you’re along for the happy ride. There isn’t a single dish you’ve had before, unless you’ve eaten his creme-fraiche chicken wings, duck confit or the semi-iconic scallops with coconut risotto and basil ice cream from Ma’s Maple Avenue restaurant in Vienna. Personally, I’m even happier with some of his newer creations, such as the raw royal sea bass with orange and fish sauce aioli, the sake-brined watermelon salad with buratta, and the umami-filled black truffle congee with natto, egg yolk, and duck confit. If I had to pick one DC chef to cook me a last meal, it might be Fabio Trabocchi. His pastas are consistently supple and beautifully sauced, including his quintessential take on lobster ravioli. Fiola Mare has become the most high profile of the three restaurants, becoming the place to see-and-be-seen on the Georgetown waterfront. It’s also the place you’re most likely to see Fabio in the kitchen and his wife Maria working the front of the house. 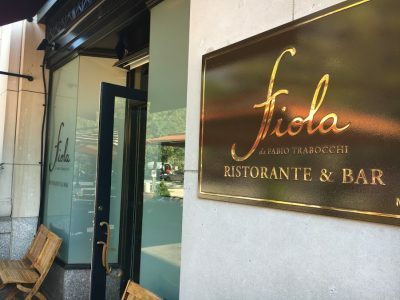 The rest of his menus — whether at the pristine seafood-focused Fiola Mare or the more earth-bound original Fiola — similarly feature luxurious ingredients coaxed into delicious presentations. If there’s any criticism, it’s that the luxury sometimes becomes excessive – with sky-high prices to match. Perhaps that’s why I’m more likely to be drawn on a regular basis to the more casual (but hardly cheap eats) Casa Luca. in fact, if you’re looking for a good business lunch spot downtown with both good food and tables spaced far enough apart to talk, you can’t do better than a table in the back room at Casa Luca. Erik Bruner-Yang is a local treasure. His rock ‘n roll ramen shop Toki Underground put H Street on the map. 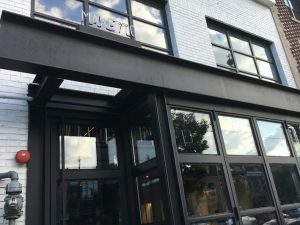 More recently, he opened Maketto, a combination restaurant, retail operation and coffee bar in a sprawling space that feels like the coolest community center ever. And the food, oh, the food. If you’re a fan of the spicy, sweet, tart, pungent and herbaceous funk of Southeast Asian food, this is the place for you. Get the Cambodian sandwich at lunch. And don’t miss the signature Taiwanese fried chicken at dinner – it’s a contender for the best fried chicken in town. Other than Rose’s Luxury and Little Serow, this tiny Filipino storefront is the only place in town with the draw and no-reservations policy to have diners lining up well before the 5:30 pm opening. 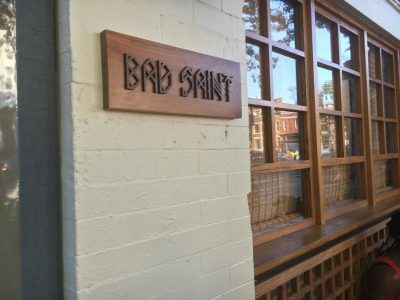 And now that Bon Appetit has named Bad Saint the #2 new restaurant in the US for 2016, those lines will only get longer. It’s worth it. This is Filipino food without compromise – bursting with big and challenging flavors and ingredients that will surprise the most jaded palate. Try the garlic rice with pork and fried egg or the tiger shrimp with mango and cucumber. A dish like clams with Chinese sausage and Sichuan chile reminds me why seafood and pork is such a beloved combination in different cultures around the world. Add some of the house rice to the delicious broth and you’re eating the Filipino equivalent of a gumbo that would do New Orleans proud. 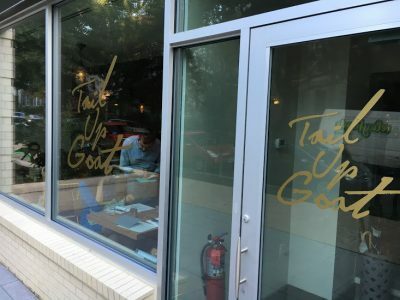 Started by several Komi/Little Serow alums, this place was a hit from day one. 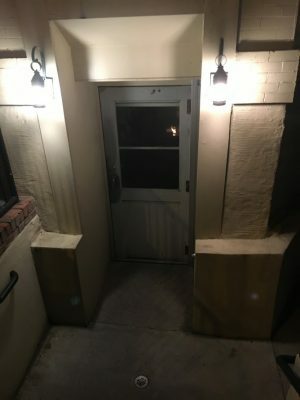 Add bonus points for opening in Adams Morgan rather than Shaw. Here, I’d start by focusing on the bread. Somebody here is a bread whisperer, delivering luscious toasts with seemingly odd combinations. The opening dish of chocolate-rye bread topped with salt-crusted sardines is no longer on the menu, at least for now, but others have stepped up to take its place like the red grit sourdough with liver mousse, the seaweed sourdough with pickled mussels, or the brown rice bread with red kuri squash, hot honey and pecans. Then pick some other medium plates like the stracciatella or a pasta (recently a terrific ricotta ravioli with a pecan and kale pesto) and then one of the bigger plates like the whole stuffed fish (lately a whole branzino stuffed with saffron-pistachio rice, fennel, citrus and pickled raisins) or the popular lamb ribs for two, stacked high with herbs and sumac onions. If you’re looking for a vegetarian option, the roasted eggplant with sweet corn, za’atar, hazelnut, and burnt bread sauce is delicious, in large part because of the addictive burnt bread sauce (there’s that bread again). 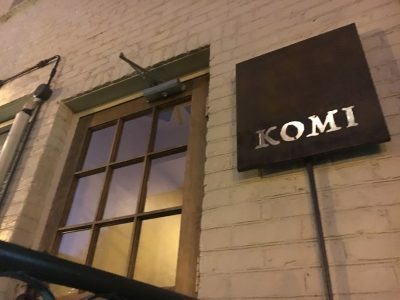 In some ways, Komi and Little Serow couldn’t be more different — the former a big-night-out $150 tasting menu of Mediterranean flavors and the latter a first-come, first-served northern Thai joint for $49 a head. But look closer and you’ll see that they share more than a physical building. They share the sensibility of chef-owner Johnny Monis. That means high-level, flavor-forward cooking without being showy or gimmicky. It means having set menus that build from lighter dishes to more substantial dishes — usually a rustic roast goat or suckling pig at Komi and pork ribs with mekhong whiskey at Little Serow — that leave you feeling like you’ve finished a meal rather than a series of hors d’oeuvres. 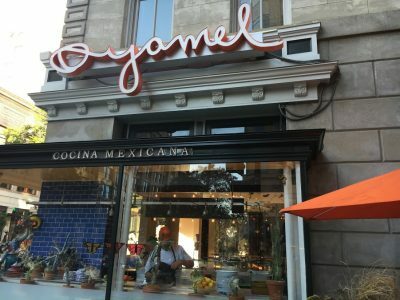 And it means having the personal attention of a chef, unlike many nowadays, who has stuck close to home rather than try to expand his “brand.” No restaurants beyond this one townhouse on 17th Street. No cooking shows. No line of pans. He may be the most mysterious of the big-name chefs in town. But that focus has kept these siblings on top with no sign of fading. 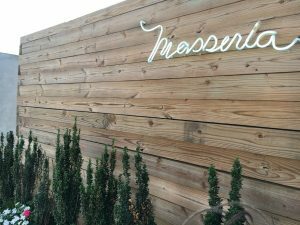 I don’t think there’s a cooler space in DC right now than Masseria, starting with its not-close-to-the-beaten-track location near Union Market and continuing with the exposed-brick warehouse vibe. You choose four, five or six courses and then let Chef/Owner Nicholas Stefanelli and crew deliver some of the prettiest and most refined Italian dishes in town. Be sure to make a pasta course one of your choices and marvel at the quality of the produce and the care that has gone into its cooking. Also, if you’re looking for a foie gras hit, this is a good place to satisfy it. The best Indian food in DC, although not as far ahead of other good spots – like Passage to India in Bethesda – as some of the accolades would imply. You can’t not start with the palak chaat, one of the truly iconic dishes of DC, and one that lives up to its billing. Then go with whatever sounds good — maybe the tuna chutneywala, the braised lamb kashmiri, or the old standby chicken tikka masala — you can hardly go wrong with Chef Vikram Sunderam’s cooking. 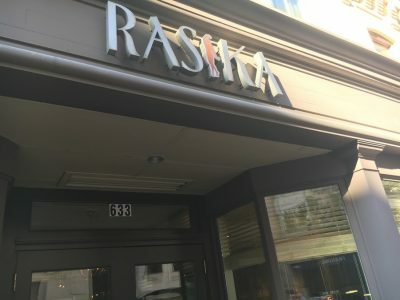 Looking forward to trying Bindaas, Rasika’s street-food centric sibling that recently opened in Cleveland Park. This unassuming father-daughter Izakaya knows what it is and what it isn’t. It’s an authentic Izakaya, or Japanese gastropub. That means you can get pristine sashimi here but not sushi. Udon and soba noodles yes; ramen no. Maybe some Japanese restaurants would try to expand their offerings to reflect trending American tastes. Not Seki. And that’s the beauty of the place. 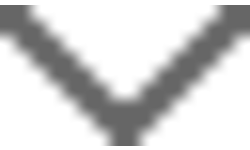 It has integrity, focusing on what it does well and what is traditional rather than trying to be all things to all people. Try something from each menu category to create a balanced meal: raw, fried, grilled, steamed and simmered. And bring the meal to a simple and comforting end with some fried rice with garlic chips. 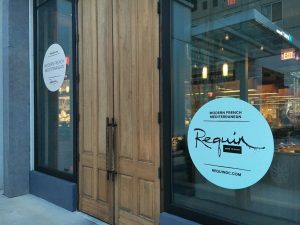 Give Philadelphia restaurateur Stephen Starr credit. He knows how to create an atmosphere. 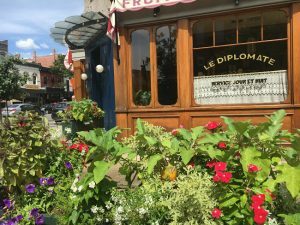 Step into the meticulously re-created French bistro and you feel like you’ve stepped through a wormhole from 14th Street straight to the 14th arrondissement. That attention to detail carries over to the food. Textbook onion soup, salade Lyonnaise, steak frites/au poivre, loup de mer, and one of the best bread baskets in town. Still my favorite Jose Andres spot. Start with some guacamole or a refreshing salad of hearts of palm, grapefruit, orange, radish and avocado. Then throw a few small plates together or some tacos. In cooler weather, there’s no better way to take the chill off than the $9 bowl of pozole rojo. 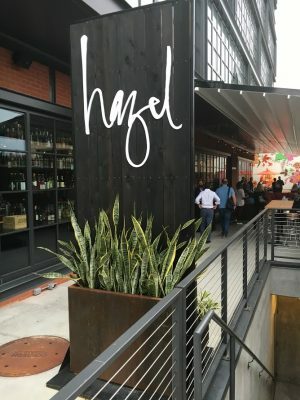 If Hazel had made its debut three or four years ago, it’d be a much bigger deal. But even with the crowded field, few places can match the combination of creative food and comfortable vibe of this hang-out in Shaw. The medium-size plates involve interesting combinations, the sourcing is carefully curated, and the young staffers are well-informed and earnest. Try the steak tartare with egg yolk and caramelized onion dip, the himachi crudo, or the crispy chickpea tofu. Somewhat disappointing were the much-touted sticky-crunchy ribs and the gnocchi with pork-kimchi ragu. 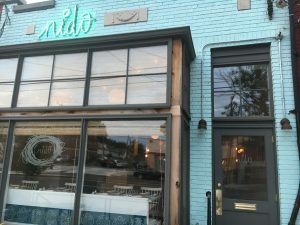 Cozy Mediterranean spot that gets bonus points for setting down roots in an under-served neighborhood on Rhode Island Avenue in Northeast DC almost to the Maryland border. Get a few small/medium plates, maybe a pasta, and then share the Basque seafood stew or bone-in Tuscan rib eye. You’ll leave well-fed and wishing that you lived closer by. Sometimes you don’t want dinner to be particularly challenging or to have to remember to get a reservation weeks in advance. You want familiar food done right and that prime time reservation waiting for you day of. Michael Schlow’s Casolare and Alta Strada nail (and heighten) the kind of Italian comfort food that feel like slipping into like a warm bath at the end of the day. 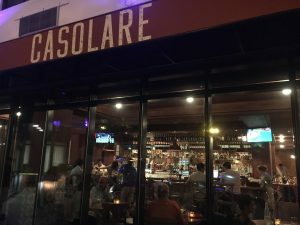 While Casolare is more seafood focused, they have a similar cooking style and price point that I’d think of them interchangeably and go to one or the other depending on where I was coming from. 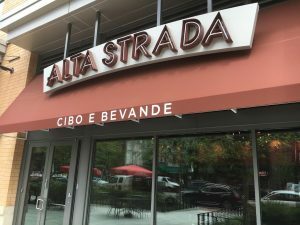 At Casolare, start with some burrata with tomatoes and anchovies or shrimp with bread crumbs; the equivalent at Alta Strada might be homemade ricotta and crunchy meatballs with garlicky tomato sauce. Then move on to some of the most satisfying pasta dishes in town, including a terrific tagliatelle Bolognese at Alta Strada, or a well-proportioned pizza at either spot with a thin and crispy crust. The common thread of many of Schlow’s dishes is a background chile heat that never overwhelms but keeps things interesting. Note: I haven’t yet been to Metier, Minibar, Thip Khao, Marcel’s, Bindaas or Iron Gate Inn, any of which could crack the list. Rick, thanks so much for this list. I never know where to take out-of-town friends or make recommendations to people who ask. And I know I can rely on your judgment. This is really cool! Georgeous descriptions Rick! Makes me wish I were there to try them all, instead of here in Geneva! I will share the blog with DC friends! Any recipes to share? Wasn’t planning on recipes for the website but have lots! Anything in particular? Great reviews with some less hyped places. Thanks for adding Nido and Kyirisan to my ever growing list. Love your blog, Rick! I have foodie friends coming to town for the weekend and will try to choose one of the places on your Top 20 list. I am wondering how hard it will be to make reservations at any of them at this relatively late date…. 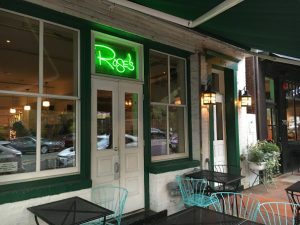 what is the dreaded “seating policy” that you refer to above for Rose’s? 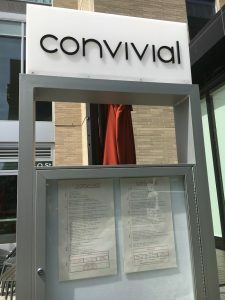 Hi Laura — You could possibly still get into Convivial (early or late), Kyirisan, Fiola/Casa Luca/maybe fiola Mare, Requin (in Merrifield), Kapnos, maybe Hazel and Nido. Another newer place is Arroz, opened by Mike Isabella who owns Kapnos. Several other places don’t take reservations. Rose’s and Bad Saint get huge lines and you’d have to get there at least a couple hours before opening. 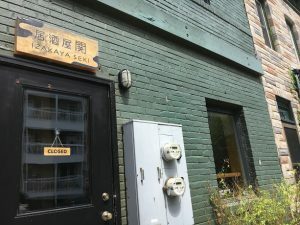 Izakaya Seki and a hot new place Himitsu also don’t take reservations but they could get there at opening and be seated (Izakaya could even get there later and not wait too long). 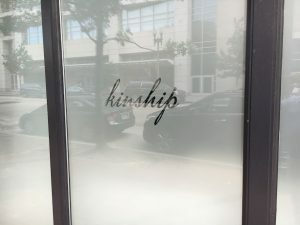 Another new place is Bindass for street food Indian and there’s a new chef at Ripple in Cleveland Park doing a short tasting menu that foodies are liking. Let me know if you need any further help!